Honoring the District’s commitment and efforts in utilizing best practices in the acquisition of goods and services, the Round Rock ISD Purchasing Department has been recognized by the Texas Association of School Business Officials (TASBO) as the recipient of the Award of Merit for Purchasing Operations. 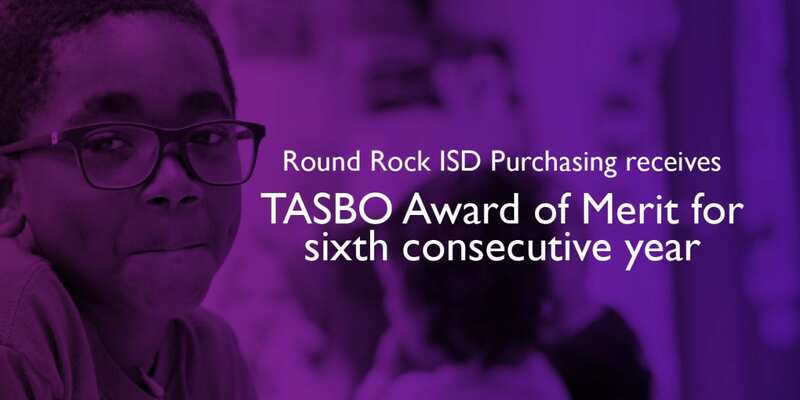 The TASBO Award of Merit for Purchasing Operations recognizes a school district’s achievement in implementing best practices in the area of purchasing. This is the sixth year in a row that the Purchasing Department has earned this distinction. The District’s Purchasing Department will receive the award in March during the recognition ceremony. Jamie Spiegel is the Director of Purchasing and Materials Management, Danny Poolman is the Purchasing Manager and Wendi Randall is the Distribution Manager. Purchasing buyers and specialists are Kim Chappius, Ellissa Slape, Craig Randall, Donna Colburn, Brenda Roque, Denisa Page, and Annette Landry.